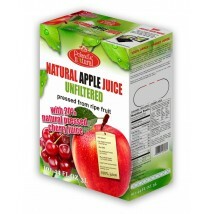 CONTAINS: 100% APPLE – CHERRY JUICE. 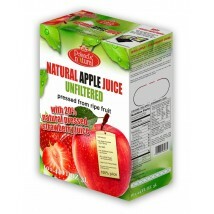 INGREDIENTS: PASTEURIZED, UNFILTERED JUICE PRESSED FROM WASHED AND SELECTED RIPE FRUIT: APPLES (80%) AND CHERRY (20%). The Bag in Box packaging consists of a carton, inside there is a flexible container with a tap. Inside of the flexible container, the juice is closed in a vacuum. The tap does not let any air inside while pouring juice. Our juice stay fresh for 14 days after opening, provided that the tap is always covered with juice. Percent Daily Values are based on a 2.000 calories diet. The nutrition and energy value depends on a season of the year and variety of raw materials. The table shows the average value. 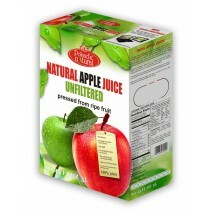 Nature never makes two things of the same - our juice can vary a little, depending on the variety of apples and season. 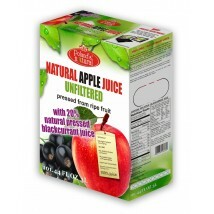 Our juice squeezed out from the fruits in 100%, contains residue from the juice, which is evidence of it’s naturalness. The residue, after repeated shaking bag with juice up, is mixing up with the juice again. Once opened, store in a dark place at temperature between 35 ˚F and 68 ˚F. Consume within 14 days. Keep away from products imitating intense odors.